Super bright LED rechargeable spotlight up to 247 lumens. Weatherproof. High and standard brightness mode. SOS distress signal. Emergency light/blinking light. Two position handle, to ensure comfortable and ergonomic access. Swivel stand. Battery level indicator. 6V 4Ah sealed lead acid battery. Supplied with AC/DC mains charger and 12V DC car plug adaptor for portable charging. · Standard brightness mode up to 8 hours. · High brightness mode up to 3 hours. · SOS distress mode up to 20 hours. 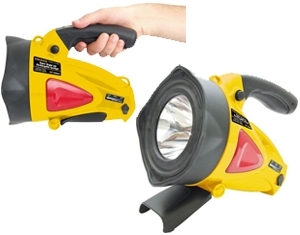 · Emergency light up to 25 hours. · Emergency blinking light up to 50 hours.